I love the Tyler Perry one! Thank you so much for the laughs Blondie-these whiners are bringing down a good week! Some great photoshops of Chima! Blondie, you never cease to amaze me. Blondie! Diary of a Madwoman, foreshadowing this morning's events! There is one every year that goes to the mirror! Oh yeah Blondie- bringing back Janelle- priceless! Love it! That last photoshop of Chima looking into the mirror is a fine representation of what Chima really is. 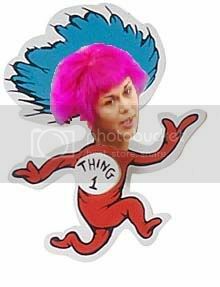 Can you make Lydia into the girl with the pink hair from Lazy Town, as she just compared herself to the girl? That is great. Thanks, Blondie.